WASHINGTON (CNN) -- President Obama said Monday he will attempt to block bonuses to executives at ailing insurance giant AIG, payments he described as an "outrage." President Obama says AIG "finds itself in financial distress due to recklessness and greed." "This is a corporation that finds itself in financial distress due to recklessness and greed," Obama told politicians and reporters in the Roosevelt Room of the White House, where he and Treasury Secretary Tim Geithner were unveiling a package to aid the nation's small businesses. The president said he has asked Geithner to "pursue every single legal avenue to block these bonuses and make the American taxpayers whole." Obama spared AIG's new CEO, Edward Liddy, from criticism, saying he got the job "after the contracts that led to these bonuses were agreed to last year." "All across the country, there are people who are working hard and meeting their responsibilities every single day, without the benefit of government bailouts or multimillion-dollar bonuses. 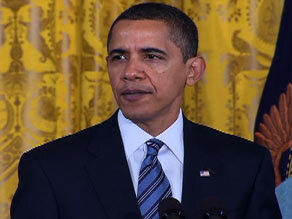 You've got a bunch of small-business people here who are struggling just to keep their credit line open," Obama said. "And all they ask is that everyone, from Main Street to Wall Street to Washington, play by the same rules. That is an ethic that we have to demand." Obama said he would work with Congress to change the laws so that such a situation cannot happen again. Then, coughing, he added in jest, "I'm choked up with anger here." Republican Sen. Charles Grassley of Iowa didn't appear to be joking, however, when he spoke with Cedar Rapids, Iowa, radio station WMT. "I would suggest the first thing that would make me feel a little better toward them [AIG executives] is if they follow the Japanese example and come before the American people and take that deep bow and say, 'I am sorry,' and then either do one of two things: resign or go commit suicide," he said. "And in the case of the Japanese, they usually commit suicide." Under pressure from the Treasury, AIG scaled back the bonus plans and pledged to reduce 2009 bonuses -- or "retention payments" -- by at least 30 percent. That has did little to temper outrage over the initial plan, however. Percentage of Americans who blame the economic crisis on "bad loans by banks"
Obama received support from fellow Democrats, including Sen. Christopher Dodd, chairman of the Committee on Banking, Housing and Urban Affairs. "This is another outrageous example of executives -- including those whose decisions were responsible for the problems that caused AIG's collapse -- enriching themselves at the expense of taxpayers," the Democrat from Connecticut said. He noted in a written statement that executives at other companies that received bailout funds have volunteered to forgo bonuses. "There's no reason why those at AIG shouldn't do the same," he said. Later, Dodd told CNN he is considering an unusual approach to get the bonus money back. "One idea we're kind of thinking about is a tax provision," the Connecticut Democrat said. "We have a right to tax. You could write a tax provision that's narrowly crafted only to the people receiving bonuses. That's a way maybe to deal with it." Dodd said the notion is in the "earliest of thinking" and has not been settled on as a way to resolve the issue that has set off outrage in Washington and across the country. In the House, Democrats are trying to shame AIG executives into forgoing the bonuses. They're also investigating possible legal avenues Congress can take to force the company to return money used for bonuses, a House Democratic leadership aide and a House Financial Services Committee aide said Monday. The committee is trying to determine whether Congress can force AIG to renegotiate the bonuses, which the company says it is legally required to give employees under contracts negotiated before the company received its first infusion of bailout dollars in September, according to the committee aide. Both aides said it is unclear what authority Congress might have to force AIG to take back the bonuses. Complicating the issue, said the committee aide, is that the first infusion of cash to AIG was authorized by the Federal Reserve before Congress passed the $700 billion bailout bill, also known as the Troubled Assets Relief Program, which included some restrictions on executive pay. Liddy will face intense questioning about the bonuses when he testifies Wednesday before the House Financial Services subcommittee on capital markets. On the floor of the Senate on Monday, Majority Leader Harry Reid, D-Nevada, issued a stinging rebuke of AIG, calling executive bonuses "beyond outrageous." "Previously, AIG had agreed at our request to make no payments out of its $600 million Financial Products deferred compensation pool," he said. He said he had already asked for the names and titles of the people who are to receive the payments, "and it is surprising that you have yet to provide this information." "Covering up the details of these payments breeds further cynicism and distrust in our already shaken financial system." He added that he also is seeking "whatever contracts you now claim obligate you to make these payments" and the names of whoever negotiated them. "Finally, we demand an immediate status report as to whether the payments under the retention plan have been made," he said. The information was needed, he said, to determine whether bonus recipients "were involved in the conduct that led to AIG's demise and subsequent bailout"; whether the company is "truly required" to pay them; whether the contracts "may be unenforceable" because of fraud or other reasons; and whether "any of the retention payments may be considered fraudulent conveyances under New York law." CNN's Elaine Quijano contributed to this report. All About Timothy Geithner • American International Group Inc.